The "few" people swinging between the Democrats and Republicans are actually the largest voting bloc in America. 38% of Americans identify as independents, compared to 31% who call themselves Democrats and 26% who call themselves Republicans. They don't really swing between parties, either. 81% of independents "lean" towards one party or the other and are considered "closet partisans." Research has shown that those independents share the partisan political values of the party they lean towards. As far as "incentivising" non-voters to vote goes the problem is really that people who are non-partisan are much more likely to not vote. True independents--those that didn't lean towards one party or the other (less than 20% of independents)--were significantly less like to say they registered to vote or vote. Only 33% of true independents said they voted in the 2018 midterms, an election that saw turnout of nearly 50%. And the 2018 midterm turnout was so high because voters were partisan af. And this isn't exactly something new. 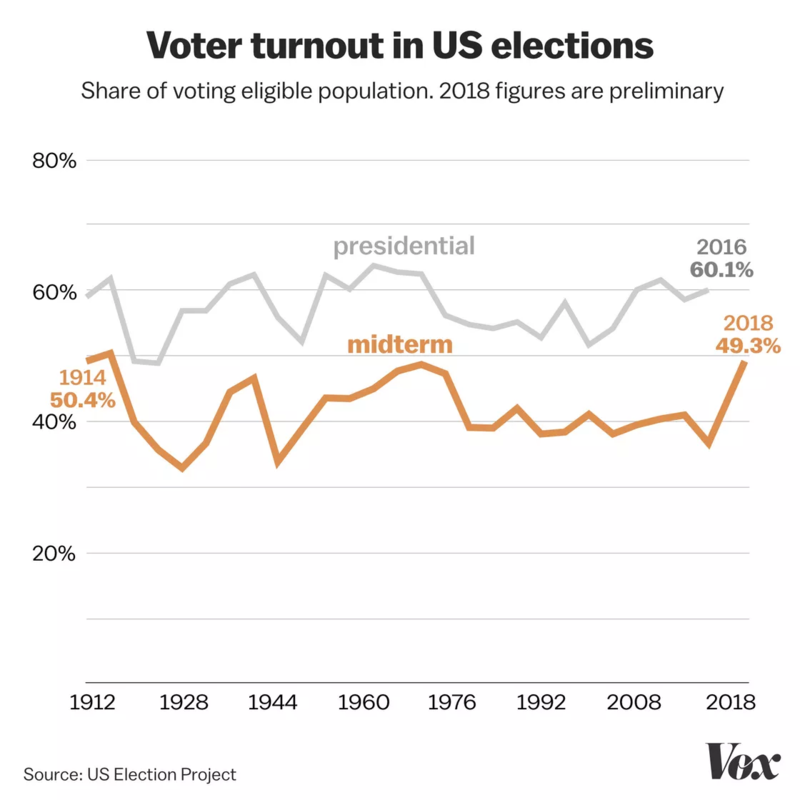 Over the last century voter turnout has never really cracked the mid-60s. You could argue that this is because the parties only ran run-of-the-mill candidates, but it's much more likely that a significant portion of Americans simply aren't political and don't really care who runs the country or feel that the system is so rigged that their vote wouldn't matter. Even candidates in recent history who had a lot of positive buzz about them--Clinton in '92 and Obama in '08--only goosed turnout by a few percentage points (and then turnout slumped the next election cycle). I doubt there's a candidate that could persuade some of that 40% of non-voters to vote for them (or enrage some portion of that 40% to vote against them). I think a lot of the reason that so many Americans can get away with being apolitical is down to the Electoral College. The structure of electoral politics in this country dis-incentivizes participation. To whit, as a Seattlite, there's little point in my personally voting in state or federal elections. This area is overwhelmingly Democratic, and my one vote for (or against) that majority ain't moving the needle. But as we've seen, demographics change and every vote can make a difference. But particularly in primaries where you have more power to help decide who will be on the big stage. Unless you're an independent and your state only allows party members to participate in primaries. Sure, but the big media narrative of US elections revolves around "swing states" and "swing voters". We talk about the horse race, with an unspoken assumption that the candidate who raises the most money will win. Like it's a foregone conclusion before the polls have even opened. Even if the demographics HAVE changed, the narrative has not. And that narrative pushes voters to stay home in a bunch of tiny ways. Not a swing voter in a swing state? Stay home. Your preferred candidate was vastly outspent? Stay home. Which would be an artifact of the Electoral College again, right? No, that one at least is decided on the state level. Some states (I believe) let everyone vote in both primaries. Not mine though. No states let people vote in BOTH (or all), but some states do let people choose a primary to vote in year to year regardless of their registered party. You still only get to vote in a single primary per election. A pedantic distinction, but a real one. Which means that the few people swinging between the Democrats and Republicans are actually 7.2% of voters. At another point, he said his critics “are deranged and/or running a deliberate disinfo campaign.” “Positively unhinged,” he wrote about them a separate time. Hopefully they realize they can do better than this guy. Although the one piece the article mentions is interesting, and defended Elizabeth Warren. Let's look at some of his greatest hits! 8/22/2016 - Did Clinton Foundation Sway Arms Policy? 8/24/2016 - Was There ‘Pay To Play’ At The Clinton Foundation? 10/19/2016 - Will Clinton Let Wall Street Control Retirement Savings? 08/10/2016 - Are The Jobless Numbers Cooked? Donald Trump joins critics from both parties who say the official unemployment rate is deliberately misleading. … He hired the guy who was writing Anti-Hillary Pro-Trump articles, during the general election? Now that I've fully read the article and sat staring at the screen for a bit... So the Sanders campaign makes a pledge not to attack other candidates in the primary. At the same time they secretly hire this guy, who writes near daily articles attacking everyone else in the primary, while never disclosing that he works for the Sanders campaign, probably creating all sorts of fun conflicts of interest. And might have only disclosed thay hired him because The Atlantic found out about it. Am I overanalyzing, or is this not a great look? I do believe any other (Democratic) candidate would be suffering hearing loss from the howls of outrage right now. The case for this person being Anti-Hillary? Sure. Does that Anti-Hillary streak rise to the level of Pro-Trump? Well, for a start, if we're going to use a list of their 'greatest hits' we can't leave off the anti-Trump pieces, and it would be worth checking just what those Anti-Hillary pieces look like. I didn't run the all down, but the Sanders and Warren one is misleadingly titled in that list. The Jobs report one reads as positive to me, and all the rest seem to have a positive framing. Of course, it's a smaller sample size since 90% of his work from the period seems to exist to attack Hillary. He also wrote the article "Beto O’Rourke frequently voted for Republican legislation, analysis reveals" that was linked off the above article and was circulated heavily on social media back in December. In it Sirota touted a report by Capital and Main, a "non-profit news organization," that analyzed Beto's voting record and showed that he voted against his Democratic peers nearly 170 times. What Sirota didn't quite mention in his Guardian article was that he wrote the Capital and Main report. The Atlantic article mentioned that piece where Sirota defends Warren, but doesn't mention that defense when listing people he's said positive things about. I know they can't list everyone Sirota has said anything about, but just seemed like a significant oversight considering they talked about that particular piece and Warren's high profile and being closer to Bernie's 'lane' than a lot of the other candidates. I'd disagree on the positivity. The unemployment one is more like 'even a stopped clock is right twice a day' piece; it reads: "it may have seemed like another unsubstantiated outburst from a famously loose-with-the-facts candidate." I didn't read all the anti-Hillary ones, but clicked on two of the more hostile headlines (LINK 1; LINK 2) and they don't seem any more negatively framed than the Trump ones. I really think that's secondary to him possibly being secretly hired while attacking current opponents and only officially announcing that he was hired after having the Atlantic find out about it. It means it's possible his attacks on Beto for instance where coordinated with the campaign that made a pledge to not go negative. Whos payroll he was on, without disclosure. Yeah, like I said, disappointing and I think they can do better. Especially like you say, with the "is-he-or-isn't-he" a journalist or part of the campaign. Representatives for other top Democratic presidential candidates ― including Sens. Kirsten Gillibrand (D-N.Y.), Amy Klobuchar (D-Minn.) and Cory Booker (D-N.J.), and Rep. Tulsi Gabbard (D-Hawaii) ― did not immediately respond to HuffPost’s requests for comment. Completely agree. I live in Georgia, and I might as well throw my ballot in the trashcan, because there is no way my vote is going to make a difference in this ultra-red state. Still, I went and voted last November (it was my first time, and I was very excited, despite knowing it was futile), and will vote again in 2020. But judging by the flags, trucks, and license plates I see here, it won't make a difference. The Electoral College has to go. Wait, you think the electoral college makes voting in state elections pointless? We are so f*cked if people that seem to be engaged thinks voting for president is the only vote that matters. No, I don't, but as far as Georgia goes, it seems to be pretty much all Republicans all the time, regardless of whether it is state or presidential election. But I will continue to vote in both, because it is the only way things can change. That said, the Electoral College has to go. Good catch. That was poor phrasing on my part. I was thinking about my state's Congressional Representatives and only typed the first of those three words. … You literally just had a gubernatorial election that was decided by 54,723 votes. It was 50.2% to 49.8%, and the D candidate very possibly would have won without the shenanigans of running against the guy in charge of the election. GA is primed to become a swing state, if anything your vote is becoming increasingly important. Good reason for that, too! The Republicans steal elections there. You're right. Even though my point about Georgia in general is still valid, I should have said Fannin County (where I live) instead, which is what I had in mind. Here, Brian "Vote Suppressor" Kemp got 9292 votes, and Stacy Abrams got 1806. All that said, I will continue to vote regardless of the shenanigans of the people in charge, and will continue to hope for a change. I really don’t see a way forward unless the economy crashes or the Democrats run someone with the charisma of a new JFK. I feel like the economy isn't rocking for most people. Good thing the Republicans disenfranchised most of those voters anyway so they won't really matter even more now.. The white folks? Well they have shown time and time again that some scary images on Fox News will keep them voting against their best interests over and over again. So I’m officially depressed about ______________ based on what I’m reading on Facebook. Please, jdzappa -- just.. just don't do this. For your own mental health. It's going to happen every time, about any subject. There's a time when I would have dug into the demographics of this, and would have had something to say about the conservative movement since (at least the time of) Reagan actually *was* offering these voters something in their best interest when he offered European Catholics the chance to become white, but...I'm old. Whatever it is, it is, and I don't have much ability to change it, so. Besides, I'm not even sure you're looking for a response from me which is cool, I get it--even just self-expression for its own sake is important. edit: ya know, I might be able to engage with this without even digging into anything deeper than what I know off the top of my head about the 2016 vs. 2018 elections. Obviously the 2016 elections were terrible. The 2018 elections, though, were incredible. The Senate should have been a disaster for Democrats, the House (with a couple of exceptions) is still gerrymandered from 2010 as are a lot of the state races. Elections have been *really bad* for Democrats since 2010. Yet the Democrats had major successes in 2018. They did so in spite of everything you're talking (and correct) about--it's not a case where, like, the Republicans forgot to be evil for one election or something and forgot to activate all their suppressive measures. White people didn't forget to vote in 2018 for some strange reason. So as bad as things are, there's still hope. So while a bad economy won't have the effect it should have in swinging things away from the Republicans, that doesn't me it won't have *any* effect, and elections are clearly not out of reach yet looking at what happened in 2018. The economy is always a strange thing for me to grapple with. I know for the long term good of the many, the economy taking a small dive on Trump's watch is the best thing. For me...not so much.